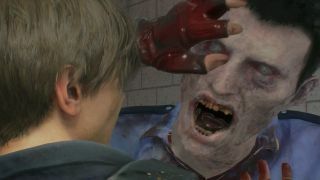 While some speedrunners were able to clear the one-shot, time-limited Resident Evil 2 demo in mere minutes, it seems most players weren't able to (or were too scared to) finish it at all. According to the beta's official stats, of the 2,455,154 players who attempted it - and that only includes people who opted to share their play data - only 26 percent, or around 638,000, finished the darn thing. Unsurprisingly, North America, the biggest market for consoles, represented the biggest chunk of demo players. Resident Evil's birthplace, Japan, was close behind, followed by South America and Europe. I'd be interested to know how many unique individuals played the demo, but seeing as how many players made duplicate accounts to bypass the demo's one-shot rule, we'll probably never know. According to the game's official site, a more detailed stats tracker will be released alongside the full game on Friday, January 25. This will extend beyond the beta to continually monitor trends and records. I look forward to seeing players fight to represent Leon and Claire in the character choice category. I'd love to see an official tally for our collective zombie kill count, too. My estimation: a lot. If you still haven't played the Resident Evil 2 demo, you've got until Thursday, January 31 to give it a shot. You can get it free on PS4, Xbox One, and PC (via Steam) - all you need is a few gigs of hard drive space. As we argued last year, remakes like Resident Evil 2 are at their best when reimagining the original game, not slavishly recreating it.